Love this scene from Grey's Anatomy. Shout out to my homes who know this scene/still watch Grey's. without losing all the knowledge you have now? I'm not greedy, say 5 years time? Shouldn't I be focusing on the present and future rather than dwelling in the past? Quarter life crisis since I hit 23, now I'm really at my quarter life crisis. Focusing and looking forward to the future? How to determine that whatever action, whatever decision you make is right? How to be a good person and how not to be a bad person? There are a lot of "I DON'T KNOW"s.
I don't know what decision is right and what is wrong. Frankly, it's always wrong, lol. If I could turn back time, I would know what to do. I had already known, so I could make the right decision. 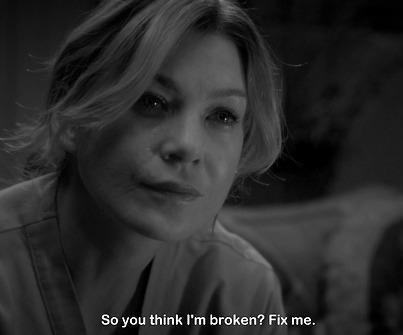 I want to fix things that I can't fix now. 5 years ago, I would graduate in a different field. 5 years ago, I would not go to the place and I would not meet somebody. 10 years ago, I could tell my family things that I did not say. 15 years ago, I could tell my granny that the infection is going to take her life. When you don't even know the right way to fix it? Losing more time, losing more chances. Too may opinions, minds get polluted, corrupted and infkuenced. You're scared of not having a car. You're scared before you get a car. You're scared when you get a car. You're scared after you get a car. You're scared of losing a car. You're scared of not finding someone. You're scared before getting into a relationship/friendship. You're scared when you're in a relationship/have a friendship. You're scared of losing someone. Aren't we all living in fear? Some people show, some people don't. It's impossible to be carefree innit? It's been a long time since the last read your blog, it seem nothing much to do on my task for today so I opened your blog and start reading from the latest blog post to previous, while listening to Ed-Sheeran. I got tearing when I was reading the post this post, because I wish I could have reunion dinner with my mom this year that I missed only for this year. I wish the time could turn back like the post you wrote if there's a time machine and fix the times that I missed. I won't be greedy I just want have a meal before my mom pasted away. I always love your post in FB in snapchat in insta & blog about how much you love them, and appreciate your family still with you. God bless you and your family. Hope your father recover soon. Keep it up, you're a strong girl Daphne.